The Das Keyboard 4 Professional for Mac ($175 MSRP; $168 on Amazon) isn’t the first mechanical keyboard I’ve owned—that spot goes to the company’s older, less expensive Model S ($133 MSRP; available on Amazon), which came equipped with two USB 2.0 ports built into its side that force you to move the mouse over to access the ports. And you have to use function and modifier keys to tinker with the Mac’s media controls or volume. Another frustration: the Model S keyboard requires two USB connections to power it. With the 4 Professional for Mac, it’s as if the company’s designers looked at the Model S and said “nah.” That’s a good thing. The Das Keyboard 4 Professional for Mac is an upgrade over its predecessors in every way. The keyboard’s dedicated media keys and an analog control knob are both welcome features. Gone is the shiny, easy-to-smudge plastic top case that was a part of Das Keyboard’s industrial design for so long. In its place is matte-black aluminium, which provides more durability than plastic can afford. Gone too is the need to fiddle with function and modifier keys if you want to mess with your media settings or audio levels. The 4 Professional for Mac comes with a dedicated set of media keys for starting, stopping, or skipping through audio tracks, a mute button, and a button for putting your system to sleep. My only complaint about these new keys is that they’re not matched, aesthetically, with the rest of the keyboard. But that’s a minor complaint in the face of the functionality they provide. To the right of the media keys, you’ll find a solid-feeling mechanical volume knob. The knob feels great to use, gently clicking as it turns. The keyboard comes with two USB 3.0 ports baked into it, located on the rear right edge of the keyboard instead of the side. It’s s smart design decision, allowing you to keep your mouse or trackpad next to keyboard while the ports are in use. Speaking of ports, you’ll only need one USB port on your computer to connect and power the 4 Professional for Mac. 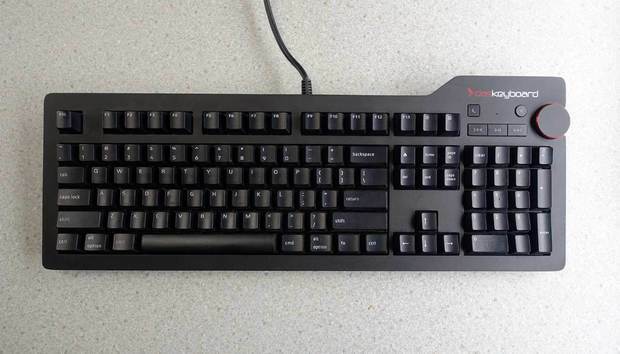 The hardware comes with two different switch choices to bury under its keys: Cherry MX Blue, which provides a satisfying click with each key press, or Cherry MX Brown, which is much more quiet and less tactile. No matter what switch-type you settle on, the keyboard comes with gold switch contacts, ensuring at least 50 million keystrokes before you can even think about wearing them out. The key response is excellent, requiring a minimal amount of pressure for the hardware to register a keypress. That said, when the time comes to go mobile with my MacBook Pro, the difference between the 4 Professional for Mac and the MacBook Pro’s keyboard is dramatic enough that my work is guaranteed to be full of typos for the first few hours of typing. The Das Keyboard 4 Professional for Mac is built using premium materials and boasts a number of design improvements over its predecessors, but you’ll pay for the nose for it. At $175, the Das Keyboard 4 Professional for Mac doesn’t come cheap. But if you’re serious about typing, you’ll find that its steep price is worth the pleasure it provides.